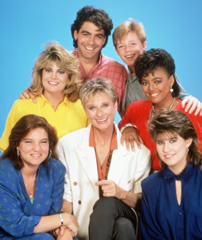 Performers include: Lisa Whelchel, Kim Fields, Miny Cohn, Nancy McKeon, Charlotte Rae, Mackenzie Astin, Cloris Leachman, Felice Schachter, Julie Piekarski, George Clooney, Julie Anne Haddock, Sherrie Krenn, and Molly Ringwald. A spin-off of Diff’rent Strokes, this sitcom centers around former housekeeper Edna Ann Garrett (Charlotte Rae) as she serves as housemother for a group of diverse teenage girls at all-girls school Eastland Academy. The primary students are spoiled Blair Warner (Lisa Whelchel), fun-loving Natalie Green (Mindy Cohn), energetic Dorothy “Tootie” Ramsey (Kim Fields) and street-wise Joanna “Jo” Polniaczek (Nancy McKeon). Later in the series, Edna was replaced by her sister Beverly Ann Stickle (Cloris Leachman). The ladies are helped by studly handyman George Burnett (George Clooney) and young orphan Andy Moffet (Mackenzie Astin), whom Beverly eventually adopts.